Is your company aware of how the gig economy has changed arbitration agreements? The U.S. is taking a favorable approach to the enforcement of arbitration clauses in gig worker agreements. But first, let’s back up and make sure you understand why this is important. However you classify gig economy workers – independent contractors, freelancers, non-agency contractors, moonlighters, temps, third-party consultants, human cloud workers – it is critical to understand the laws, as well as the consequences for getting it wrong. Penalties for improperly classifying workers as independent contractors can be significant, including labor-related claims that can include damages for payment of the notice period, statutory severance, unpaid holidays, benefits, and overtime. Additional liability could come in the form of payment of back taxes for failure to withhold, contribute, remit, and report payroll taxes, which would include income tax and social contributions, with penalties and interest. Most likely, if you are engaging a gig worker you are using an Independent Contractor Agreement or Statement of Work. Often times, companies that leverage gig workers place arbitration clauses that contain class action waivers into their contracts. Arbitration is a form of alternative dispute resolution used to adjudicate disputes between parties to a contract in lieu of litigation. Employers generally favor this out-of-court proceeding for its increased privacy, predictability, and settlement potential, as well as reduced time and costs, compared to litigation. These clauses can prevent a group of workers from coming together collectively to bring common claims (such as employee misclassification) against companies into courts. By requiring individual actions to be brought by each worker in arbitration, companies can resolve individual cases outside of the court system. Typically, such arbitration would be expected to result in a faster conclusion than a class action case in court, and has the resulting benefit of having no legal binding precedent for how companies are required to treat their workers under the law. As the gig economy grows, there are going to be more settlement decisions affirmed by the validity and enforceability of arbitration provision in its agreements with workers. Let ClearPath put your mind at ease. You don’t have to have anxiety over the gig economy and worry about the risks of worker misclassification. You can request a complimentary review of your potential risk and exposure analysis from ClearPath. ClearPath Workforce Management risk mitigation services bridge the gap where fear of risk may prevent engagement of top talent. 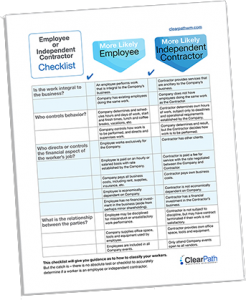 We’ll also explain how ClearIC™ can automate and simplify the Independent Contractor evaluation process while mitigating your risk. For all other questions about assessing your workforce or conducting a review of your current hiring processes, the ClearPath team can assist you. This blog article is for general information purposes only and does not provide an in-depth review of arbitration laws. It should not be solely relied upon or substituted for legal or professional advice. Use of the information provided is at your own risk.